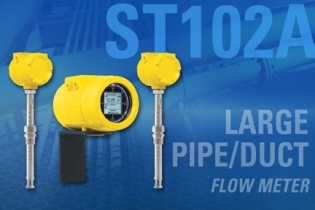 The new ST102A Air/Gas Thermal Mass Flow Meter features an advanced dual-element averaging system, improving installation repeatability and accuracy for larger diameter pipes and ducts. Flow measurement applications involving line sizes 12 inches or greater can realize improved installation accuracy and repeatability by averaging the flow rates of two elements. Distorted, swirling and non-repeatable flow profiles can result in decreased accuracy of single point meters. It is often impractical or impossible to provide the required straight-run for a fully developed flow profile in large lines. The transmitter electronics average the input from two independent flow elements into a single output. Each flow element can be independently configured for insertion length and process connection to allow installation flexibility. One flow element can be integral with the flow transmitter, or both can be configured as remote for easier access and visibility to the digital display/optical four button user interface. The flow transmitter also provides independent information for each flow element, saving time when performing service checks.